When men think of the salon they think about women getting pedicures and spending hours getting their hair done. This might make men feel less comfortable getting the professional grooming services they need. Therefore having a place specifically where men feel comfortable spending time and relaxing is why you should go to a salon just for men. When you are in the chair conversing with your stylist you will get a perfectly tailored haircut for you from professionals that have extensive training. Your stylist will go the extra mile and trim your neckline eyebrows beard ear hair etc. They are trained to take care of the small details that your significant other is probably always asking you to clean up. Seeing the same stylist regularly gives you the opportunity to learn more about your hair head shape and style preferences. With consistent visit with your favorite hairstylist a professional relationship will be made where you can have great conversation and they’ll know exactly what you need that works best for your look. They’ll remember you and your hair and can cut it just how you like it every time. When you come to a salon like Metro For Men it’s not just a place to get your haircut but an environment that was designed just for you. We have TVs so you can watch your favorite shows or the big game. In fact metro FOR MEN offers 12 personal satellite televisions with over 700 channels to catch up on the latest sports news or market updates. We also provide a traditional shoeshine stand and a private locker room. Our clients can read today’s paper and check out the latest gadget magazine all while counting on on-time appointments. metro FOR MEN’s clients experience current techniques products designed exclusively for men all in a space that he doesn’t have to share with his female counterpart. This means your traditional trip to the salon is actually an experience where you can relax and enjoy. With so many services making men feel healthy and looking great why not pamper yourself a little and go beyond the traditional haircut. metro FOR MEN is the first full-service men’s only salon in Orange County CA (formerly known as Saville Barber) and is still the leading men’s only salon in Lake Forest created by Krista Martin because men deserve a place of their own too. Why choose to go to a men’s only salon? 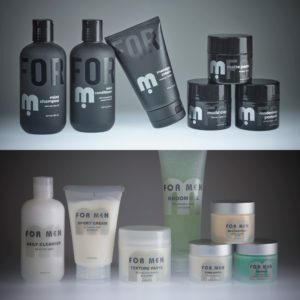 Because we understand that Men want a unique salon experience that is on-time consistent every time while using products made just for him in a masculine environment. The goal of metro FOR MEN is to provide services that men may not feel comfortable getting at a women’s salon while reshaping the way men think about their grooming rituals. We accomplish this by using products designed only for men’s type of hair nails skin and body. We extensively train our associates how to perform our services that keep the client’s health and safety first. metro FOR MEN is different from other men’s only salons from the products we use to the training and development of our service providers.